We’re making some progress now, and the hardest part – figuring out the style templates - is over. I’m now ready to take Marcie’s manuscript and reformat it into a presentable book format. First, however, I want to remove any previous formatting that might be embedded in the text. As she typed her new book, Marcie quite likely inserted a number of formatting characters. She may have used tabs to indent a line, used three periods to make an ellipsis character, or added a few extra line returns to add space between paragraphs. She may have inadvertently added a few extra spaces in the text or after a period. The printed version of the new book most likely won’t have a problem with the added or incorrect formatting. Our goal for the printed book is to move things around and adjust pictures and paragraphs until each page looks perfect, then we’ll be exporting the finished copy in a .pdf format, which is essentially a picture of each page. The eBook version, however, may well have problems with some of these formatting characters, and it’s best to remove them. The task of removing these characters isn’t difficult with the use of either a text editor or our trusty word processor. I’ll show you how I get rid of these formatting characters using LibreOffice. (If you’re using a different tool, the process may be different but should be similar). Start by choosing Edit - Find and Replace. Note: In the verbiage below, for the purposes of clarity, I’ve substituted the special character ‘˽’ for the space character. If you try to do this on your own at home without adult supervision, make sure you type a space wherever the ‘˽’ character appears. Another note: In the Find and Replace box, expand Other Options (by clicking on the + in the box alongside it) and check the box for Regular Expressions. Tab characters. We want to remove any tabs embedded in the text. In the Find window, type \t, which represents the tab character; the Replace window should be blank. Then click on Replace All, and all the tabs will be removed. Empty paragraphs. If the Return key is pressed more than once, the result is an empty paragraph, which some eReaders have a problem with. In the Find window, type ^$, then delete anything in the Replace window. Click on Replace All, and all empty paragraphs will be deleted. Trailing spaces. Any spaces following a period and the start of a new paragraph should be removed. Do this by typing ˽*$ (space, asterisk and a dollar sign) in the Find window and delete anything in the Replace window. Then click on Replace All. Ellipsis. Rather than typing three periods for the ellipsis character, which some eReaders have a problem with, it’s better to use the actual ellipsis character (…). As it turns out, in the default mode for English, LibreOffice automatically makes this substitution. If this isn’t the case for your version, type three periods in the Find window and the ellipsis character (ALT-0133, which translates to “Hold the ALT key down while pressing the numbers 0133, then release the ALT key”) in the Replace window, then, once again, click on Replace All. Spaces preceding an ellipsis. There should be no spaces preceding an ellipsis character. 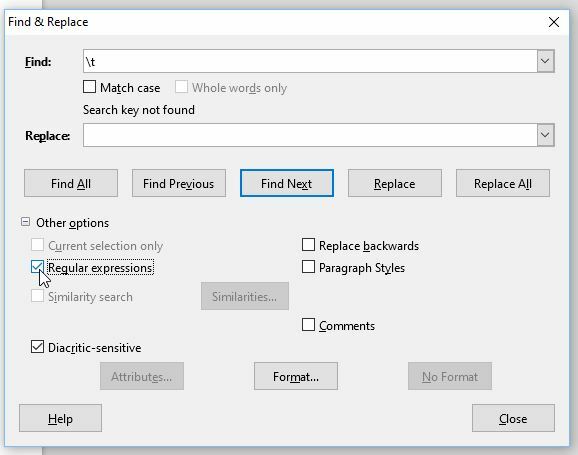 To remove them, type ˽*… (a space, and asterisk followed by the ellipsis character – ALT-0133) in the Find window and an ellipsis character in the Replace window, and click on Replace All. Extra spaces. To remove any extra spaces, type ˽+˽ (a space followed by a plus sign, followed by another space) in the Find window and a single space, ˽, in the Replace window, and click on Replace All. This takes care of all the formatting issues that have caused me grief when producing our previous eBooks. LibreOffice has a good Help section on the Find and Replace function if you need to learn more about it. Make sure you save the newly unformatted manuscript, make backup copies and save to your favorite Cloud before moving on. Now let’s talk a little about images and pictures in our two versions of the book. If your previous books made it to the New York Times best seller list, and publishers are standing in line to get the rights to your latest offering – the following doesn’t apply. In fact, I look forward to any advice you can give me. If, however, you’re like us, and will be doing some low volume, print on demand (POD) books, this is my understanding of how it works. If you have no color images – not even yellow highlighted text, or you choose to print your book with all images in a grey scale format, the book will be produced on a black and white printer at a much less expensive rate than on a color printer. If, on the other hand, you want any color at all in the book, the entire book will be printed on a color printer – in for a penny, in for a pound. Once you choose the color option, you lose nothing by adding all the photos you want, except that, unless by doing so, the number of pages increases. I want Marcie’s photos to be sharp, crisp and in color, so I make sure they are all high resolution - at least 300 DPI (Dots Per Inch). Thus, a 4” x 4” photo should be at least 1200 x 1200 dots or pixels. The subject of photo resolution and why it is important is covered quite well in this nice tutorial provided by the University of Michigan. On the other hand, with the eBook version of our book, there are a few problems when using photos with a high resolution. First, high resolution photos have large file sizes, often 2.5-5 Mb each. Marcie’s new book will have 20-30 photos embedded, which means the electronic book version may well be upwards of 100 Mb if we used all hi-res photos. That’s a huge file to download and store on most eReaders, (btw, the last time I checked, both Starbucks and McDonalds limited file size downloads to 50 Mb, so our new customers couldn’t download Marcie’s book to read with their coffee) and there’s very little to be gained anyway, since most eReaders don’t have a display large enough to view a high resolution photo. In addition, some eBook sellers subtract a ‘Delivery Fee’ from the royalties which is based on the size of the file - the bigger the file size, the lower the royalty paid. In general, it’s usually better to insert much lower resolution photos in the eBook version. David Kudler in his blog The Book Designer covers the subject in more detail here. In general, I typically reduce our eBook photos to 96 PPI (Pixels Per Inch) and keep the photo width and height to between 500 and 850 pixels. We still have to create the cover, put together a proof copy in .pdf form for the print version, and then, once we’re happy with it, create our eBook version. Mere child’s play at this point. Stay tuned.